Right Home Right Place is a website owned and run by Shropshire Council. Personally identifiable data from any surveys we conduct will be deleted after two years. Should you wish to have your data removed before this, then contact us at info@righthomerightplace.com or at the address in the How to Contact us section below. We collect information about you to process your enquiry, engage us to provide services and, if you agree, to maintain contact with you in the future to update you about the services we provide, or supply you with information which we think may be of interest to you. Shropshire Council will not share your information with third parties for marketing purposes. If you receive our marketing information via email through our provider, GovDelivery, you can click the unsubscribe link at the bottom of this email and this will automatically update our mailing list. If you receive emails or telephone contact directly from us and wish to withdraw your consent to contact you, please click here and notify us. You have the right to request a copy of the information that we hold about you. If you would like a copy of some or all of your personal information, please email Right Home Right Place at info@righthomerightplace.com or write to us at the address provided on the ‘How to contact us’ section. You have a right to be forgotten and may ask us to delete personal information we hold on you by contacting us at info@righthomerightplace.com or writing to us for further guidance. Cookies are text files placed on your computer to collect standard internet log information and visitor behaviour information. This information is used to track visitors’ use of the website and to compile statistical reports on website activity. If you live in Sutton upon Tern Parish, there’s still time to fill in your survey. Downsizing, growing family, housing needed where you work? 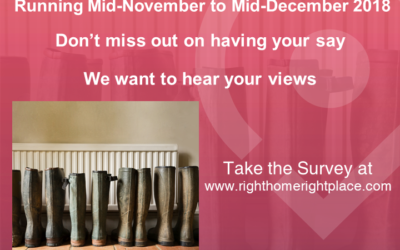 Let us know what your housing need is.